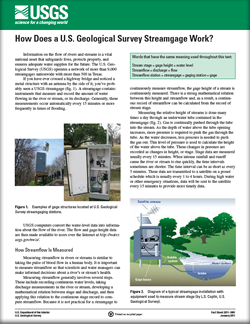 USGS Fact Sheet 2011-3001: How Does a U.S. Geological Survey Streamgage Work? Lurry, D.L., 2011, How does a U.S. Geological Survey streamgage work? : U.S. Geological Survey Fact Sheet 2011–3001, 2 p.